This hands-on focused course is designed to teach you how to hack like a pro and take down large networks! Learn the basics of red-teaming, penetration testing, and vulnerability analysis from two industry experts! This training covers: system and network recon, intel gathering, vulnerability identification and analysis, system exploitation, pivoting, privilege escalation, and more! This course is intended for penetration testers, security analysts, security administrators, network administrators with a security focus, and anyone else interested in learning about offensive reconnaissance and exploitation techniques used by red teams and black hats. This course focuses on the fundamentals of penetration testing and ethical hacking as is appropriate for beginner to intermediate skill levels. Seating is limited for training events. Don’t wait, register now! View the training description to learn more about this training! Head to the Training page for more information about this year’s training lineup! New for 2019: Threat Hunting Mini-CTF! New for 2019! Competitors will be searching for network attacks in data from a multi-server corporate-style network using a Splunk server, and they will also be deploying their own cloud servers, sending attacks, and detecting them. All challenges are freely available and will remain so after the event. This event will use BOSS OF THE SOC data published by Splunk, Google Cloud, Suricata, Drupal, and Metasploit. The Threat Hunting CTF takes place on Sunday, May 26th, 2019 at 14:00 in the Lockpicking Village! This event is graciously hosted by Sam Bowne! Sam Bowne has been teaching computer networking and security classes at City College San Francisco since 2000. He has given talks and hands-on trainings at DEFCON, HOPE, B-Sides SF, B-Sides LV, BayThreat, LayerOne, Toorcon, and many other schools and conferences. New for 2019: Coffee Wars! New contest for 2019! Do you have a favorite coffee? Put it to the test and have it blindly judged by a panel of LayerOne attendees! Bring your favorite coffee in ground or bean form, and we’ll put it in a bracket against other contestants. All coffee will be brewed in the pour-over method and served black. Coffee Wars takes place in the Hardware Hacking Village on Saturday, May 25, 2019 at 13:00. Come join us for an after-lunch coffee! 2019 Full Talk & Speaker List! The full details of this year’s amazing speaking lineup are up! Read full details and speaker bios for each talk over on the Speakers page! Have you booked your ticket for LayerOne 2019? Don’t wait, get your ticket now! While you’re at it, make sure to get your discounted hotel room via this direct booking link before discounts end on May 11th. Learn more about this year’s venue on the Venue page. Tamper-Evident King of the Hill Returns! The Tamper-Evident King of the hill challenge returns for 2019! This is a hands-on contest where attends attempt to defeat tamper-evident devices without leaving evidence. King of the Hill offers a variety of mechanical and adhesive seals to test your skills, As always, this year includes some new seals for even the most veteran King of the Hill players! 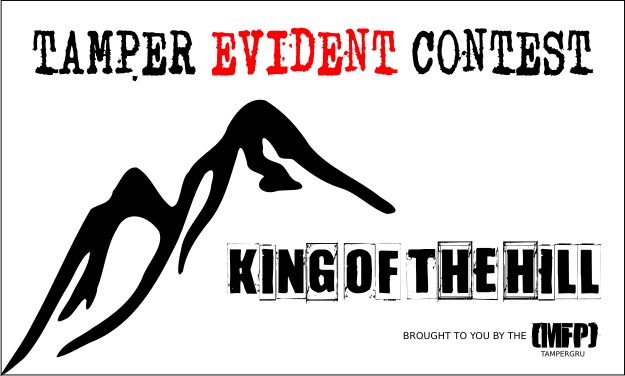 Full contest rules on the Tamper Evident KotH page. The LayerOne Tamper-Evident Contest runs from 10:00 Saturday to 14:00 Sunday! Have you booked your ticket for LayerOne 2019? Don’t wait, get your ticket now! While you’re at it, make sure to get your discounted hotel room via this direct booking link before discounts end on May 11th. Learn more about this year’s venue on the Venue page. More details on this year’s speaking lineup and other contests coming soon!